Swimsuit season is soon to be upon us, and rockabilly swimsuits and vintage bikinis are definitely trending! Here’s everything you need to know! Rockabilly swimsuits and vintage bikinis are definitely making a comeback as trendy beachwear in 2016! Figure flattering high-waisted bottoms and polka-dot tops are all the rage once again. With summer quickly coming upon us we thought we’d take a look as some of our favorite styles, as well as the history of swimsuits throughout the ages. That being said, you may think of conservative ‘bathing gowns’ as the first form of swimsuits, but that isn’t so! 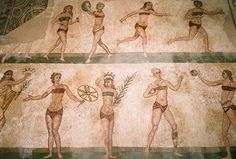 In fact, Greek and Roman bathhouses offered women swimsuits similar to modern day briefs and bandeaus! Bathing suits slowly began their evolution from bikinis, gowns, bloomers, shorts, and then finally into the one and two-piece suits we know today. 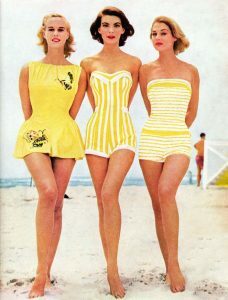 One piece, vintage style rockabilly swimsuits as we know them today began in the 1920’s through to the 50’s. These suits hugged the body and flattered women’s natural curves in all the right places. At Punkabilly Clothing, we carry rockabilly swimwear for all shapes and sizes. Prints like leopard, cherry, floral, and classic polka dot bikinis and vintage one-pieces are all available. Still on the fence about what rockabilly bikini is right for you? Come check out our selections of universally flattering rockabilly swimsuits and vintage inspired bikinis at Punkabilly-Clothing.com!